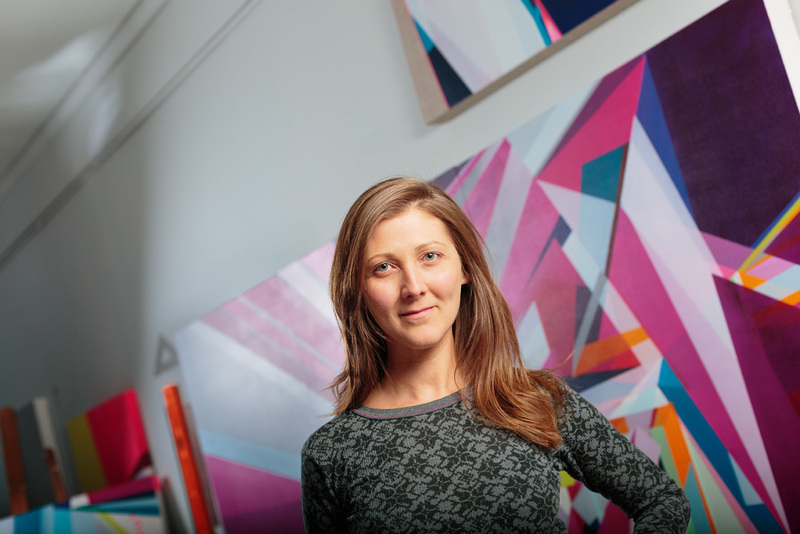 Marna Shopoff is an Indianapolis-based visual artist with an emphasis on abstract painting and intuitive drawing. She received her Bachelor of Fine Arts degree and Master of Fine Arts degree from Herron School of Art and Design, Indianapolis, IN, where she has taught as an adjunct professor in the Foundations and Drawing Programs. Interested in the concepts of design and spatial relationships, her work explores the idea of perception, place identity and visual memory. Marna has led panel discussions on abstract learning and haptic drawing at the Foundations in Art Theory and Education Conference (US) and the International Drawing and Cognition Symposium (UK). She is the recipient of various honors and awards, including The Individual Artist Award | Indiana Arts Commission, the Mildred Darby Menz Award, and the 2014-2015 Stutz Resident Artist Award. 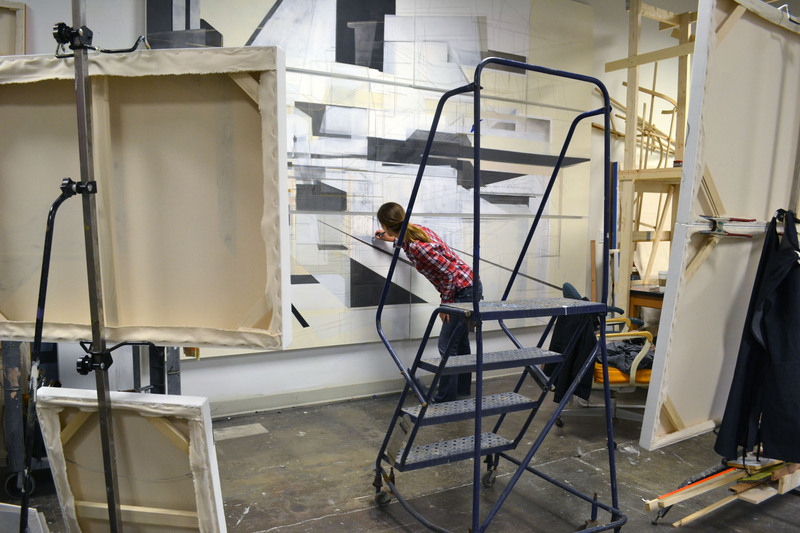 She has taken part in artist residencies at locations across the US and Europe including the Leveld Art Centre (Norway); the Vermont Studio Center (VT); Teton Artlab (WY); Taliesin, The Frank Lloyd Wright School of Architecture (WI); and the International School of Painting, Drawing and Sculpture (Italy). Marna’s work has been published in print circulations including Studio Visit Magazine, Manifest and Blue Canvas. She has taken part in exhibitions both locally and internationally (solo, group and collaborative), and has participated in art fairs including PULSE New York (NY), the Miami Project (FL) and VOLTA12 Basel (Switzerland). Marna is currently represented by Jonathan Ferrara Gallery, New Orleans, LA. What happens when we set aside the need to represent what we see and instead respond with how we feel? To me, life is fragmented and layered, a mosaic of experiences interwoven with reflection and intuition: the places we visit, the homes we live in, the countries we explore – each overlapping and influencing one another. Blending contemporary and classical approaches to painting and composition, I examine how human experience, place and personal memory affect ones perception of self. I am interested in the interpretation of and the interactions with the spaces that surround me. What memories or feelings do these places spark and what sort of energy do they project? As an artist, I investigate whether someone can access and experience a new view of the world through my work and how I can create a new space using my art. My work explores whether, through art, we can share our individual perceptions. Using a vibrant display of geometric abstract paintings, I explore the concept of spatial identity, translating how place and experience uniquely intertwine. I use abstraction as a way to move through and define the 2-dimensional picture plane, and color to express a certain idea or mood. Perspective, saturation and transparency, together with techniques of glazing and layering, create an illusion of depth and space, while visually conveying the fusion of memories and experiences. © 2019 marna lee shopoff. all rights reserved.